We spent the morning preparing for Rosh HaShana - we're having lots of guests over the two day holiday. The radio was on the whole time, and we listened to the summarizing hit parade of the year's Hebrew songs. Near the top of the list was a song titled "Nothing Will Hurt me". It was written by Erez Stark - whose names means Strong Ceder, and it is preformed by the Knessiat Hasechel rock band. Their name, in English, comes out something like Church of Reason. Erez was killed in action a few years ago, a young lieutenant. May the coming year be better than the previous ones. The destruction of the Jewish communities of Erez Yisrael in the first century of the common era, with the destruction of the 2nd temple at its heart, followed by the genocide of the Jews of Judea 70 years later, were a catastrophe of epic proportions. All the while as they were happening, Jewish creativity never slowed down for a moment; indeed, the mishnaic era is rightfully regarded as one of the peaks in a history of millenia of cultural creativity. Yet while the creativity was never blunted, the echoes of the catastrophe reverberate resoundingly all the way into the main political discussions of the 21st century. There were once in Jerusalem two men, one named Kamza and the other named Bar Kamza. And there was a third man who's name has mercifully been lost, who was a friend of Kamza and an enemy of Bar Kamza. This man hosted an important social event, and told his servant to invite Kamza. The servant mistakenly invited Bar Kamza. When Bar Kamza arrived, the host threw him out. Bar Kamza, publicly mortified, begged to be allowed to stay, offering to pay the cost of his board, or even the entire cost of the event, but the host refused. Bar Kamza was especially furious that the high society of the time, the scholars, watched this happen and didn't do anything to save him from humiliation, and so he went to the Romans and told them the Jews were plotting a revolt, and this set the whole story in motion. The moral of the story, the Talmud tells us, is that Jerusalem was destroyed because of sin'at hinam, unnecessary animosity between people. Not, say, occupation, or the heavy weight of Roman rule, or a wish for freedom or liberty or any sort of noble action one could attribute to the Jews or ignoble policy to attribute to the Roman. The Jews were punished, according to their own version, because they deserved it. Philip Mendes has a fine review of Benny Morris' new book, here. If you don't have the time or inclination to read the full book, this seems like a reasonable synopsis, and can be useful to counter the many myths (=lies) often told about the war of 1948. Gerard Baker has an article in the Times of London speculating that whoever wins the upcoming elections in the US will fail dismally, and things will get better only with the next fellow (gal?). I wouldn't know about all that, but he's got an interesting underlying question: who in his sane mind would want the job right now? The reason I ask is because the situation in Israel could easily fit the same description. The job of Israeli prime minister is easily the second trickiest job in the world, trailing only after that of the American president for the things you can do wrong and the ease of messing up on a grand scale (can you think of any other such position? Let's say the chancellor of Germany screws up, not to mention Canada: who'd ever even notice?). That's in normal times. Right now, whoever's occupying that house up on Balfour st. will have to deal with all of the usual, plus making the decision about Iran. What sane person would want the job? The other day I got a phone call from a pollster, who grilled me on my opinions and positions (in Israel. She never asked me about Palin). Part of the interview included a long series of questions where I was to rate the aptitude of Bibi, Barak and Tsipi to do this that and the other. Graded between 1-10. I consistently gave Bibi 2 out of 10 (been there, done that) except for as minister of the treasury, which he did extraordinarily well. Barak got a consistent 4 out of 10 (been there, no need to go back). Tsipi? I gave her a consistent 6 out of 10. As I said to the pollster, who groaned her agreement, what do we know about Livni? Almost nothing, but we hope for the best. The Americans wonder what they know about Obama, and almost all have made up their mind (this way or that) about Palin. Well, Livni has been near the center of our limelight for a decade already, in various ministerial positions, thus trouncing all four American candidates combined, but no-one has the faintest idea if she's up to the job. With the possible exception of the 70-year-olds who ascended to the job between 1994-2001 (there were three of them), the only way we know if someone is up to the job is by letting them have it, and watching them fail. Livni has the tremendous advantage that she's apparently not corrupt, and not even all that dirtied as a political hack. Exactly a set of abilities that are irrelevant to success at the job she seems likely soon to have. So we hope for the best. By the way: if and once she gets the job, which seems rather likely, Israel will be the only country in the world with women at the head of all three executive branches: Dorit Beinish is the head of the supreme court, Dalia Itzik is the head of the knesset, and Tsipi. It's nice to be so much more progressive than all those liberals. Iran's President Ahmadinejad has just made an overtly antisemitic speech. Here's the full text of the English version, as published by his own office (I make the point of linking to the Iranian official website because sooner or later Juan Cole will tell us the man didn't say what he said). He's the president of a largish country, not a blogger from San Francisco or an anonymous comment writer from the Guardian's CIF. He made the speech in the full glare of a United Nations General Assembly session. Many media outlets were there, and each chose to report on the section of the speech they felt most interesting. Very very few of them put the man's primitive antisemitism at the center of the report; actually, many didn't seem to have noticed it. Although at NRO the did - but then, NRO is hardly a mainstream outlet, is it. Earlier this evening there was another attack by an Arab driver on pedestrians in Jerusalem. 15 of them were injured, most of them not seriously. The attacking driver was shot to death, as is customary in these cases. The BBC report's title, and I quote: Jerusalem car "attack" hurts 15. After all, maybe it wasn't an attack? Perhaps the young Arab accidentally careened into lots of pedestrians. Such things happen, don't they? Update: I wrote this post after 1am, last night, and forgot to link to the BBC report. This morning I see that it has been replaced... by an even more pernicious report. Now the title tells about an attack on troops, while still refraining from saying anything about the attacker (a Georgian militant from Tibet, perhaps?). The article itself goes out of its way to minimize the number of casualties, giving the mistaken impression that they were all soldiers, which isn't true. The severest casualty appears to have been a civilian woman, for example. A friend and reader sent me an alarmed e-mail recently, after I said in a recent post that I have a small preference for McCain over Obama - though actually, the thrust of my sentence was that both candidates are worthy. The New York Times has an article claiming that people often believe things that are demonstrably false. I expect the timing has to do with the fact (probably even a true fact) that the McCain campaign has been telling more lies recently than the Obama campaign (tho neither side is blameless, and the picture isn't black and white, if you'll pardon the pun). Anyway, the NYT informs us that there are all sorts of mechanisms at work here, and wonders if fact checking has any practical value. (I.e. will it help against McCain...). One of the people it has interviewed notes that even fact checkers can have biases. Huh. Or should I say, Humphh? There's nothing much new about all this, of course. The Church spent most of its first 1,500 years systematically lying about the Jews and just about everyone went along with it; even once there was a growing group of, shall we call them fact checkers, the Church mostly kept at it for another few centuries; in some corners it still does. In the previous century Goebbels may have been the world's top expert at demonstrating that if you say something often enough and stridently enough millions will believe you no matter how ridiculous you're being, but he had many competitors and companions in evil. But why reach so far as Goebbels: Have you ever listened to the BBC reporting on Israel? Not too much truth there, is there, especially when you get into body language of reporters and commentators. Regular readers of this blog are regularly exposed to my ire at the Guardian, but that will never make the Guardian any more committed to truth. Lest you think, as the NYT article subtly suggests, that susceptibility to lies is greater with less educated people or whatever: Bah! The most committed believers (and creators, and disseminators) of the Nazi lies were an identifiable social-economic group that was far more intelligent and educated than the masses of German citizenry. This is probably equally true of the Communists, though I have fewer of the facts at my fingertips. The readership of the Guardian, in any case, is definitely more educated than the average Briton, so apparently the case can be made that more education means more susceptibility to lies. Just switch on your TV, or reach for a magazine and let your eye flit by the first advertisements you see: if they were really true you wouldn't buy their products. Me, I've had enough contact with marketers to know that telling the truth is never on their agenda, though admittedly, getting caught blatantly lying isn't either. Have you ever noticed how fundraisers never use the word 'problems', for example, always preferring the term 'challenges'? Yep. Of course, that's but a small subset of the nexus between marketing jargon on the one hand, and the pernicious phenomenon of Political Correctness, a theology of lies if ever there was one, invented, mostly, not by McCain's side of the American cultural wars, even if it is grounded by deep roots in Calvinism and Puritanism. It's vastly better to tell and hear the truth. But don't lets pretend our side is necessarily better at it, unless we can back up this claim with.... facts. Labels: American Politics, Antisemitism, BBC, Guardian, Rational Discourse? I expect most of you have heard about "The Wave": A true story of a very charismatic teacher in a California high school who in 1967swept his students into a frenzy of fascist-like behavior based on charisma, group cohesiveness and discipline.The teacher, Ron Jones, later wrote up the story,and it was made into a fine movie. My old colleagues in the education department of Yad Vashem liked to use the film to demonstrate the potency of group pressure. Well, it seems the story has now been turned into a German feature film. Personally, I never found much in this story to be of real significance. The thing about Nazi Germany was that it wasn't the act of a class of teenagers, but rather of millions of adults; it didn't last a week, but rather many years; and the Germans never snapped out of it until the Allies had bombed them back into the Middle Ages, abolished all levels of their state from mayors to the national government, and then slowly started putting it all together again. I've been greatly enjoying the high drama of the American presidential race. Personally I'm edging towards McCain these days, and Jeffrey Goldberg's profile of him in The Atlantic Monthly has contributed to this, but I could live with either result, since the American voters this time must choose between two honorable and capable men; in spite of the torrents of verbiage that say otherwise, I think both candidates are worthy. And no, I don't think either Vice Presidential candidate is the issue. Nor are the campaign tactics either side uses or doesn't use. Still, those torrents are lots of fun. I've become an addict of RealClearPolitics, a website - evenly balanced, so far as I can see - that links to lots of stuff that's being written. One of the more interesting things I've noticed is the degree to which almost all pundits, on all sides of the debate, can't be trusted to tell it as it is. Try as they may, their personal preferences color what they see. The upshot is to emphasize the large extent to which these elections are about cultural issues, not political ones, and most people's likes and dislikes stem from these cultural differences. Somewhere in my reading I came across this, an article by Jonathan Haidt, a young professor of Psychology from Virginia. He's an avowed Democrat and liberal (in the American use of the term - never forget that the Europeans use the same word for something almost opposite), and he desperately wants "his side" to win elections - but he has managed to go beyond that need and try to be empiric and rational. Although his title, "What makes people vote Republican" literally oozes of left-wing arrogance, his answer is that ultimately, it's the Republicans who have richer thought capacities, and Democrats need to understand this. A Durkheimian ethos can't be supported by the two moral foundations that hold up a Millian society (harm/care and fairness/reciprocity). My recent research shows that social conservatives do indeed rely upon those two foundations, but they also value virtues related to three additional psychological systems: ingroup/loyalty (involving mechanisms that evolved during the long human history of tribalism), authority/respect (involving ancient primate mechanisms for managing social rank, tempered by the obligation of superiors to protect and provide for subordinates), and purity/sanctity (a relatively new part of the moral mind, related to the evolution of disgust, that makes us see carnality as degrading and renunciation as noble). These three systems support moralities that bind people into intensely interdependent groups that work together to reach common goals. Such moralities make it easier for individuals to forget themselves and coalesce temporarily into hives, a process that is thrilling, as anyone who has ever "lost" him or herself in a choir, protest march, or religious ritual can attest. In several large internet surveys, my collaborators Jesse Graham, Brian Nosek and I have found that people who call themselves strongly liberal endorse statements related to the harm/care and fairness/reciprocity foundations, and they largely reject statements related to ingroup/loyalty, authority/respect, and purity/sanctity. People who call themselves strongly conservative, in contrast, endorse statements related to all five foundations more or less equally. (You can test yourself at www.YourMorals.org.) We think of the moral mind as being like an audio equalizer, with five slider switches for different parts of the moral spectrum. Democrats generally use a much smaller part of the spectrum than do Republicans. The resulting music may sound beautiful to other Democrats, but it sounds thin and incomplete to many of the swing voters that left the party in the 1980s, and whom the Democrats must recapture if they want to produce a lasting political realignment. If you have the time, read the whole thing and ponder it. There is much in there that is diametrically opposed to most people's pat assumptions (and pet one, too). It need not be read only in the context of American politics, and it fits much of the Left-Right discussion in many democracies, certainly including Israel. Labels: American Politics, Rational Discourse? I am too busy for much blogging at the moment, but this story needs to be related to. It's about the turmoil near Yitzhar yesterday. In this particular case the violence was started by a Palestinian would-be murderer, but that doesn't change the fundamental structure of the story. There are a small number of well-known Jewish settlements on the West Bank - Yitzhar, Tapuach and the Jewish Quarter of Hebron spring to mind as the most obvious, but there are a few more, only slightly less malicious places - which are dominated by violent evil men, thugs of the worst degree. These thugs terrorize their Palestinian neighbors, and do so mostly unrestrained by the Israeli security forces who are in charge of those areas. The thugs are a blemish on our face and defilers of our honor, but the long-standing inability or unwillingness of our security forces to stop them is even worse, as they have the power to do so, but don't use it. In future posts I'll go back to facing down our detractors for their indefensible depictions of us, but for today I'm setting aside whatever they may make of this story, and telling it as it is. But the one fundamental precept that Democrats must stand for is independent thought and speech. Huh? Democrats think, Republicans don't? That's the fundamental truth? I'm slowly making my way through the Bible with the rather new modern Orthodox interpretation of Daat Mikrah, an interpretation put together over the past 30 years or so, and completed in the 1990s. I started sometime last year, and am currently reading Judges. The other day I sat on the porch of this cabin we rented, high on the shoulder of the front ridge of the Upper Galilee, with most of the Lower Galilee spread out below me, and read chapter 4 which describes the battle of Barak and Sisra, Barak's battle plan having been inspired by the prophetess Devorah. In modern terms, Barak's army was a militia of infantry, while Sisra had 900 tanks, so Barak convened his men at the top of Mount Tabor, a steep hill, unaccessible to the tanks; once he went down to do battle he was assisted by a fierce rainstorm that turned the valley below into a sea of mud which immobilized the iron chariots. The Daat Mikra interpreter helpfully points out that precisely such a heavy rainstorm occurred at the same place and same time of year in 1953. Josephus wrote the same thing about a thousand years after the event, and two thousand years ago. While I read I occasionally raised my eyes from the book and glanced at the vista below me; Mount Tabor was the 5th ridge to the south, standing out clearly because of its unusual outline: steep slopes on all sides, cut off from any neighboring ridge. Such an experience is of course quite standard when you read the Bible in Jerusalem, but I was on vacation, getting away from it all. There is an endless supply of fools who talk about how this is all an artificial construct of cynical Zionists et.al, but at the end of the day, that's all they are: fools. Jonathan Freedland (who can at times be rather reasonable by Guardian standards) warns America that if Obama isn't elected, the rest of the world will have had it, and will be fed up. And Mighty Peeved. It's not clear what the actual implications will be, but apparently they're dire. Frankfurt airport. Three or four elderly Israeli women and one well-dressed elderly man reached the checkpoint (I think it was the fourth so far) by electric golf-cart: a service offered by the airport for elderly passengers who might have problems walking the distances. The driver of the golf cart was a courteous young woman who seemed heartened by the fact that these particular charges spoke German; and if it was German with a not fully recognizable accent, it made no difference. They were nice old people. At the checkpoint she unloaded them and assisted them up to the barrier, where she handed them over to the young Israeli security person; this was a dark skinned young woman with whom the elderly man briefly flirted, in a grandfatherly way. “And from where in Czechoslovakia do you come?” she asked him, referring to a country that exists still in his memory but no-where else. Behind the young woman stood a uniformed young German policeman wearing body armor and a sub-machine gun. As the elderly folks passed through he smiled at them, and gave a ghost of a salute. Do Holocaust survivors think through all the ironies of such moments? Probably not, I expect. This won’t have been their first trip through a German airport, and the novelty will probably have worn off. They seemed mostly interested in getting through the process so as to find a seat in the lounge beyond. But the ironies are there, even if no-one dwells upon them. Postscript: Someday Israeli air passengers won’t have to be screened through four layers of security more than anyone else. When that happens you’ll know that peace may be a reality. No speech by any politician of any nationality at any venue will do the trick, unless it manages to carry off that one. Putative peace arrangements that leave the need for those special airport precautions are perhaps better than nothing, but they won’t be peace arrangements. Here's a link to an article that drives the cutting edge for silliness even at the Guardian. The conviction by the left that the right is stupid is one of the defining and least attractive characteristics of contemporary politics. Assuming that anyone who disagrees with you is too dim to get your point is not itself a particularly brainy way to win others over to the essential correctness of your views. But it is true that to small-town Republicans the world is not a complicated place, because they have seen so little of it. Translation to English: it's not nice to be snotty about Republicans and their voters, but it's inevitable. I'm not going to parse this piece, merely to link for future use. September 1st, 2008. 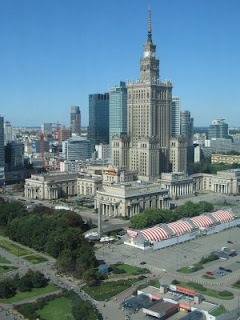 The weather is beautiful here in Warsaw, probably the best we've seen in the 9 days since we arrived. It's the 69th anniversary of the German attack on Poland that began World War 2, or at least the European part of it. No sign of this on the streets of Warsaw, so far as I could see. Apparently Polish high-schoolers go to their first day of the new school year dressed in finery, or so it seemed on the tram and the main thoroughfares. I did briefly note a black-and-white film on Polish TV earlier, with a plane dropping bombs, so some people have noticed the date even if by now you have to be elderly in order to remember the original event itself. 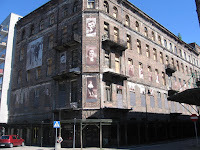 In previous posts I've mentioned the Stalinist monstrosity that stands at the very center of Warsaw, straddling the line of the Warsaw ghetto at its south-eastern corner. Here's a picture of it, followed by some ruminations. First, when it was built it wasn't intended to have all those glass-and-steel capitalist skyscrapers behind it. Nor was it supposed to have that red-and-white roofed structure in front of it, that contains a supermarket and dozens of small stalls that sell perfume, sports shoes and fired chicken. The parking lot in front of the supermarket also wasn't envisaged by the architect. Come to think of it, the advertisement placards hanging on the facade were not foreseen, either. The Nazis who invaded 69 years ago today also foresaw none of this, although they were the ones who razed all the previous structures and created the large empty expanse Stalin then used. To their real credit, the Poles are busy overcoming their nightmares and are getting on with life. If you focus on the street to the south of the monstrosity, there's also an interesting story. It's called Jerozolimskie Avenue, and you can't get any more central in Warsaw than that. But back in the 18th century it was a few miles to the south of the city. Jews had been banned from the city for about 250 years, but in the mid-1770s, just as the English colonists in Massachusetts were throwing teabags into the port of Boston, someone allowed Jews to settle in the fields to the south of town. A few years later he changed his mind and threw them out, but in the meantime their nickname for the road leading east from their settlement had stuck, and remains to this day Jerusalem Avenue. 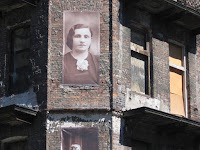 You cannot tell the story of Poland without telling about its Jews. You can't even go to the central train station. 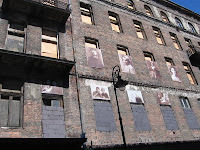 A few minutes walk to the north, not more than one block away from the Stalinist billboard for beer, the ghosts still reside. On the left, a bland residential building. In the top right hand corner, a new high rise going up, with a crane above it. And wedged between them is a ghost from the past. 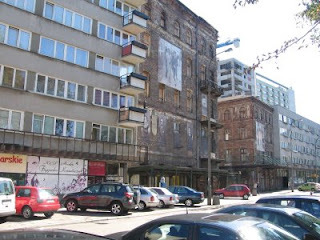 Two buildings that somehow were still standing after the ghetto was destroyed, and are standing still, to this very day. Too fragile for anyone to live in, of course, so the windows are blocked. The ghosts, however, are still there, and haunt us from the dead windows and the bare brick walls.